Boyagane, March 23: Her vision is blurry and the body is feeble but she still doesn’t want to abandon her ‘mission’ – searching for her son, ‘Sudu Putha’. Her memory of him is still vivid and fresh. Wearing a white Kandyan saree with no jewelery, holding some lotus flowers and sitting at a corner of the decorated tent at the Boyagane Army Camp, she scanned through the soldiers in ceremonial outfits who were passing by, to see whether her son was among them. She forgets all other important days in her life but not the day that her loving son’s name was added to the long list of names of soldiers who went Missing in Action (MIA). “He called me on 17 July 1996 and that was his last call saying: Amma, I came to the Mullaitivu camp safely.’ I still hear his voice,” L.M. Punchimanike said sobbing. 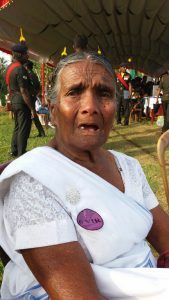 She becomes emotional when she recalls her soldier son Corporal Chandrapala Samarasekara of the Vijayabahu Infantry Regiment (VIR), who died in the infamous ‘Mullaitivu debacle,’ where the entire Army camp with soldiers of the 6 VIR and the 9 Sinha Regiment (SR), was overrun by the now defunct LTTE on 18 July 1996. 1,300 soldiers were lost, the majority of them went missing in action. A grenade attack by one of the soldiers who was in LTTE captivity resulted in the LTTE brutally killing 207 soldiers who were Prisoners of War (POWs). 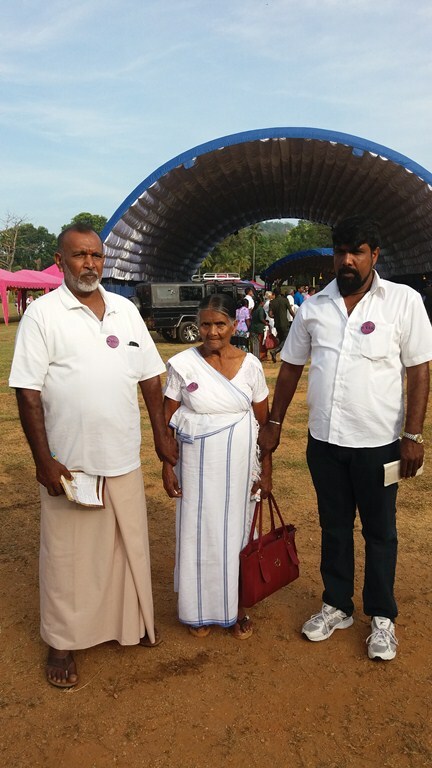 Punchimanike was accompanied by two of her sons – a retired Government employee and an ex-solder of the Special Forces (SF) of the Sri Lanka Army (SLA) – to pay tribute to her son Chandrapala and over 3,000 soldiers who had sacrificed their lives to bring peace and harmony after 30 years, at the War Hero Commemoration Ceremony named ‘Nihendiyawe Handa’ (Voice of Silence) at the VIR Regimental Headquarters at Boyagane, Kurunegala, recently. Colonel of the Regiment and the Deputy Chief of the Army Maj. Gen. Ajith Kariyakarawana, Maj. Gen. D.M.D.C.D Gunawardena, Centre Commandant of the VIR Brig. W.S Ariyasinha and a large gathering of serving officers and other ranks attended the commemoration ceremony. 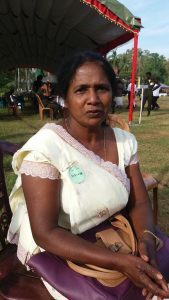 “I even saw him in my dreams yesterday,” Punchimanike, a mother of 11 children, who travelled from Welimada to Kurunegala, said, weeping, unable to control her emotions. “He came to the Naval Base at Trincomalee and we both shared the same bed. I joined my 1 SF team that went on an operation in Valachchenai in the wee hours of that day and he went to the Mullaitivu camp to report for duty. When I returned from the operation, we were instructed to go to Mullaitivu to rescue the camp that was badly attacked by the LTTE. Our group, including me, was shipped to Mullaitivu to seal off the beach front to rescue our soldiers. We confronted heavy attacks from the LTTE. We couldn’t find bodies and couldn’t rescue any of our soldiers,” Chandrapala’s younger brother, who is a retired Sergeant Major, Gamini Samarasekara recalled. He said that there were some eyewitness accounts to say that the LTTE had gruesomely murdered the captured soldiers at the Mullaitivu camp, after removing their eyes and cutting their hands and legs while they were still alive. “Some female cadres had urinated into the mouths of the badly injured soldiers who were screaming asking for water. I think that my brother may also have been subjected to torture before his death,” Samarasekara claimed. According to Samarasekara, over 500 soldiers had surrendered to the LTTE during the Mullaitivu attack but no one had returned home, so far. Punchimanike said that she was living every moment for the last 23 years thinking that the 25-year-old Chandrapala (at that time) would appear at her doorstep giggling laugh and embrace her. “He gave me his gold chain before he left home that day asking me to pawn it if I wanted some money. When he came home on leave, he stayed with me all the time. I am waiting till my Sudu Putha comes home,” said Punchimanike, who refuses to believe that Chandrapala is dead. Among over 5,000 guests – parents, wives, children and relatives – Kulatilake Padmakulasuriya, an 89-year-old father clad in a clean white national dress, refused to be seated until the commemoration ceremony was over. “I stood throughout the function to pay my respects to my hero,” said the father of Major Athula Theja Kulatilake of 6 VIR, who was 27 years old at the time he went missing at the Mullaitivu debacle. Being the only son of the family with two daughters, Kulatilake wanted him to become a lawyer like his elder sister. “But he was determined to join the Army to serve the country,” Kulatilake said. The entire wall of the living room is dedicated to framed pictures of Athula in school, cricket and Army uniforms and also all his certificates, Kulatilake has a separate place to display his son’s military items like the sword given to him as a commissioned officer. “When we see those souvenirs, we feel that our son is living with us,” Major Athula’s mother A.M. Ranmanike (82) said. The SLA had issued his death certificate but the couple is not willing to believe that their son is no more. They were delighted to see their son’s batchmates who are now Colonels in the Army. 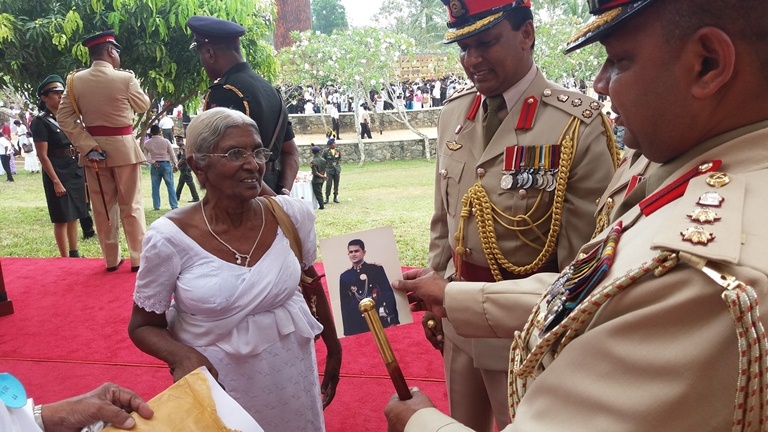 “If my son is alive today,” she said in a quivering voice showing a picture of Major Kulatilake in an Army ceremonial outfit. Corporal N.M.P Wijewardena of 2 VIR is another soldier who has been declared missing following the LTTE attack on the Kondachchi Army Camp in 1990. “My daughter was only 11 months old. He had seen her only few times. I have not received his remains and I have waited for four years expecting him to return home. But later the Army gave me a death certificate,” Malani Chandralatha said, adding that she raised her daughter alone, facing many hardships. He was 25 years old when he went missing and her young age was sacrificed to raise their daughter, who is now employed and having a child. Like other parents and wives of MIAs, she had also gone before the Office of Missing Persons (OMP) to give a statement about Corporal Wijewardena. But she said she received nothing. Although they still have hope that their children and husbands who went missing during the war will come home one day as they have not seen their remains, most relatives of the fallen soldiers have not given their details to the OMP as they lack interest or lack faith in the OMP process or lack awareness on how to report to the OMP. 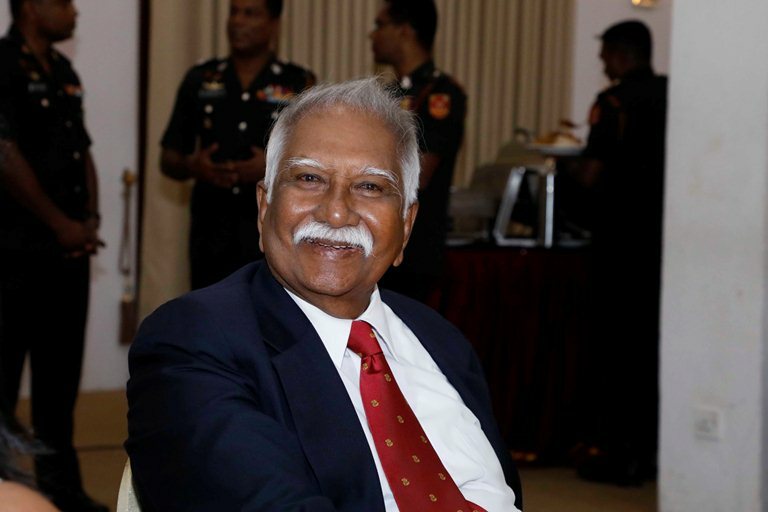 Padmakulasuriya, the father of Major Kulatilake and a former Legal Assistant of the Department of Agrarian Services, said that he had no faith in the OMP as it was biased and treated the relatives of missing military personnel differently. “Not only to the OMP but we went to the previous Lessons Learnt and Reconciliation Commission to give details of our son. But nothing happened,” he said, adding that the OMP was more interested in getting information on MIAs in the north and east than their children who were captured and tortured to death by the LTTE. Corporal R.M. Yamuna Bandara was 25 years old when he went missing at the LTTE attack in Elephant Pass in 2000. Although the Army has declared him as MIA, he was issued a death certificate. Now he has been enlisted under those soldiers who were Killed in Action (KIA). “I don’t still believe he is dead. I search for him everywhere. I went to several camps but I couldn’t find him,” his mother R.M. Sumanawathi Manike (68) said. Bandara managed to save a portion from his meagre salary to build a house of their own. Today, Manike has fulfilled his dream by building a small house from his savings of his pension, which she gets. “No value can be put on my son. Wherever I go, I look at the faces of young men to see whether my son is among them,” she said, as tears streamed down her face. Manike is not really aware of the OMP or its benefits. Looking after her sick husband, Manika still dedicates her time to have poojas to invoke blessings for her son, Bandara. Usually Bandara would return home on leave during late nights. “So I have kept the door open till late night for the last 19 years hoping that he would come home one day,” Manike said. She got emotional and couldn’t talk anymore. Some say that holding war hero commemorations would hurt the close relatives and they would be further traumatised. But especially for the parents, grieving for their missing sons is a part of their daily routine. They said that they cannot overcome grief until they have breathed their last. Maj. Gen. Ajith Kariyakarawana said that the SLA wanted to remember the fallen VIR war heroes who sacrificed their lives to protect the country’s sovereignty, as Sri Lanka is commemorating the 10th year of eliminating LTTE terrorism in the country in 2019. He said that this mass commemoration ceremony would not be an annual feature but would be held every three years to venerate the fallen VIR soldiers for their bravery. “In 1996, the entire 6 VIR battalion got killed or captured by the LTTE at the Mullaitivu debacle. Over 580 went missing and later they have been declared as KIAs,” he said. Spelling out welfare programs, he said that there are scholarships for school-going children It is the responsibility of the regiment to look after the close relatives of fallen VIR heroes who sacrificed their future for the country’s peace and harmony. “The VIR is the regiment that fought on the last day of the final battle and used the last bullet to kill LTTE Leader Velupillai Prabhakaran to end the 30-year-long war. “The VIR is the most junior regiment in the Sri Lamkan Army but we have proved our mettle and professionalism in warfare. The VIR has been awarded two Parama Weera Vibhushanaya (Decoration of Supreme Heroism) awards and over 3,000 other gallantry awards,” he said. VIR Founder, Maj. Gen. Jaliya Nammuni, commending the SLA for commemorating the fallen VIR soldiers said that the regiment was credited for its heroism and contribution to ending the war. During the JVP’s second insurrection, the then Army Commander Maj. Gen. Hamilton Wanasinghe had instructed Lt. Col. Nammuni to form a new battalion with a strength of 800 soldiers. “I felt it was no easy task as I had to form the battalion within a month. I and another senior officer, who was enlisted to support me, had to recruit and train 800 soldiers. We asked 16 infantry battalions to give us soldiers to form the new battalion,” Maj. Gen. Nammuni recalled. The Vijayabahu battalion, which was named after King Vijayabahu I of Polonnaruwa, was first deployed to control JVP activities in the South. The soldiers in the new battalion, who were deployed for the task even before their passing out ceremony, had assisted in controlling JVP violence successfully. Maj. Gen. Nammuni, who later became the regimental Colonel of the VIR, which was officially formed in 1990, said that it had fought well and professionally until the Government ended terrorism in May 2009. “The regiment, which was set up from scratch, has performed well and they are par with other regiments today,” he said. 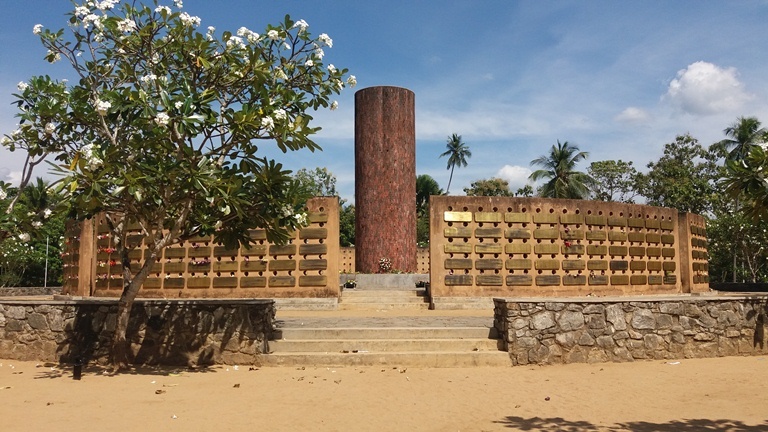 The VIR has lost 132 officers and 2,268 soldiers from other ranks in the military thrust against the LTTE since the formation of the regiment. Although a low number of MIA cases from the SLA have been reported to the OMP, 3,488 soldiers including 125 officers had gone missing during heavy fighting between the SLA and the LTTE. Military Spokesman Brig. Sumith Atapattu said that although most of the MIAs had been declared as KIAs later for administrative purposes, they had been tortured to death by the LTTE who kept them as POWs. He said that there were some records that the LTTE had kept some of the missing soldiers as POWs even until the last phase of the war. Later the LTTE had killed them. “For example, the CO of the 9 Sinha Regiment Battalion Major Hiran Dabarahewa, who was a POW of the Mullaitivu debacle, was killed by the LTTE after some years,” he said. According to Brig. Atapattu, the Army encourages close relatives of the MIAs to report to the OMP. “After four years of being MIAs, those soldiers were declared as KIAs for administrative purposes to facilitate the close relatives to obtain death certificates to get the benefits given to fallen soldiers. Later, the four-year period had changed and those who went missing during the final phases of the war were declared as KIAs after a year of being missing, he said. However, the relatives of those MIAs were reluctant to report to the OMP as their missing sons and husbands have been declared as KIAs and possessing death certificates now. “This has resulted in a low representation by the Army to the OMP,” Atapattu said. “We are old now and weary of going from one commission to another. The Government should look into the plight of ageing parents like us who are desperately waiting to see our children before we die,” Kulatilake, Major Athula’s father, said.